Firstly I’d like to thank The National for enabling us to share our views directly with you. What a talent he is. He is a great finisher in so far as his YouTube rugby sevens videos are concerned. But I am disappointed he was not accorded the opportunity to excel in rugby league. Gairo must be paired with a talented centre partner who can create the opportunities for him to put his talent to shine. The absence of Putt is obvious. The Hunters need smart, talented and powerful back rowers to run at angles off the centres and halves to test edge defences help the outside men score tries. He’s strong and powerful. I think utilising him as a backrower would do wonders. 4. Is it possible to get our players to stop from running straight into opposition players when attacking? I think our players should be advised to run into spaces between players. I’VE watched the Hunters play and lose over the opening few rounds and I think the answer to their attack is to use the ball better. They need better Ball Work. They are playing the ball on only one side of the field, and what about the other side? Why not flow the ball across the field, they should have enough speed and strength to break the defence. PERSONALLY, I will always back Michael Marum whether we win or lose. Why? 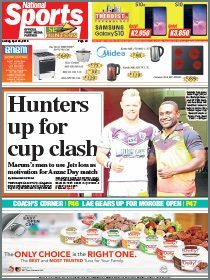 Because of Marum, PNG Hunters won the Q-Cup title in 2017. It was historical. THE PNGRFL should reconsider its deal with Digicel to show games on TVWAN. 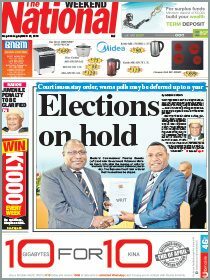 It’s because of this that many Papua New Guineans are unable to watch the Hunters games. Hunters games should be on a free to air station like EMTV. The same is true for NRL games. It’s all on pay to view TV which is out of reach many ordinary people, especially youth. Hunters and NRL games should be easily accessible for our youth to watch and aspire to be like the players on TV as well as as learning things about the game. PNG is best known in the rugby league world for our physical style — our “Kar Bump” style. “Bumpim man na em pundaun ol Meri wail lo yu.” Can we call this an old school mentality? For sure, this mentality still exists in our players today. Players have to bear in mind that you are representatives of the country, you are on the field to make your country proud of you not for your girlfriend or wife or whatever. Stop this mentality of car bump and implement some football strategies. The coach has to push players to fulfill their potential; put them under pressure and see which ones can handle it. Stop treating them like some kind of celebrities from Hollywood. We demand good performances and wins not loss after loss.